arrangement for your needs. Remember when ordering these couplings for a Vacuum system to include the Gasket Protector to extend the coupling life. This style of compression coupling is generally used in systems with pressures of 15 PSI or less. The assembly and disassembly of these couplings is fast and easy. Dual-locking side bands grip the pipe and allow higher operating pressures than standard compression couplings usually allow. 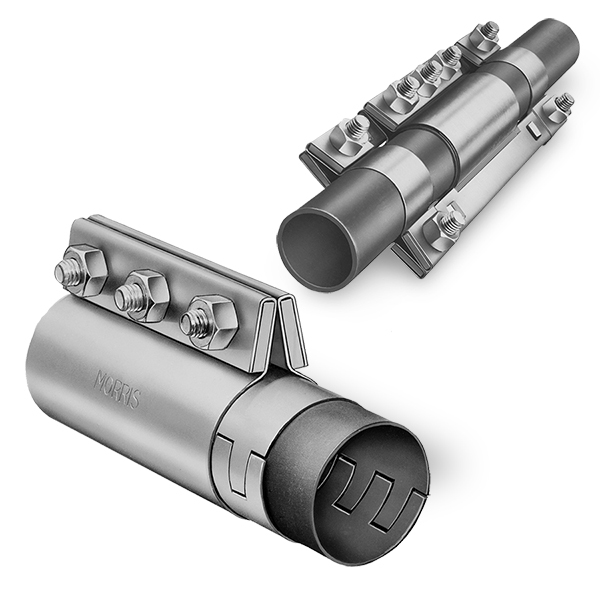 These are especially effective in resisting line end pull and providing a superior connection when excessive vibration may be present. They have also proved to be extremely useful when repairing sections of convey lines, while also providing a positive seal. As found in the standard compression coupling assembly and disassembly is fast and easy.